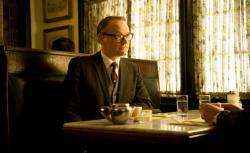 Mad Men writers: Andre and Maria Jacquemetton on Lane Pryce and "Commissions and Fees." It’s an honor to be asked back to this forum. Thank you. It was a particular pleasure reading your thoughtful dispatches this morning. Your insights are spot on and it’s clear to us that last night’s episode had the desired grim effect. Matthew Weiner and the writers were very interested this season in the success of the business and how that becomes every man for himself. Playing out the voracious hunger that goes along with ambition, achievement, and getting what you want over the season arc and how that would manifest, particularly in characters like Ken Cosgrove, Lane, and even Don, who despite their sometimes questionable choices generally uphold a certain standard of morality and/or dignity. In this episode, the firm’s success in the light of Don’s “tainted” win of jaguar has left him ravenous for more success. And, with 1967’s dark under-bubbling of cultural and societal violence, some carnage amid our characters was inevitable. We joke that on Mad Men nobody gets out unscathed. That includes Sally Draper—pushing against the boundaries set by both sets of parents, desperate for adulthood, wanting more and more until the unglamorous truth is literally physically bestowed upon her. The knowledge that being grown up means blood, humiliation, and the almost instantaneous regret of having left the comforts of mommy and childhood clobbers her. The fact that Betty gets back a cherished moment of feeling loved, and thus superior, is icing on the cake. Killing Lane is the most agonizing thing we’ve ever done, both emotionally and professionally as writers. Jared Harris has been, and indeed still is, a beloved member of our Mad Men family. He is an incomparable actor and friend. Just wrapping our heads around and committing to his suicide took months. We spent weeks in the writers’ room debating the merits and consequences, and hours in his office choreographing the deed. Every detail was meticulously mapped out—from the placement of the rope and body, to the application of the make-up, to the suicide note (we actually wrote six). In the end, all we can say is that the experience is not over. There is still one more episode to digest and consider. And what a brilliant one it is from Matthew Weiner. A season-finale glimpse into Lane’s (and Don’s) tortured soul awaits. We don’t think anyone will be disappointed.